We present an almost considered opinion about the EU referendum from our columnist Sir Eugene Nicks QC, KBE, Policy Advisor to the All-Portsea Conservative, Regressive and Imperial Association (established 1799). I trust all Star & Crescent readers are as delighted as I am by the result of the Grand Patriotic Plebiscite. This was a victory for fear over love, belief over thought, orderly queues over anarchic free-for-alls and knee-jerk invective over rational debate. In short, we as a nation – and as a city – succeeded because we played to our strengths. Read more here. We reluctantly present some words of praise for Portsmouth’s most (in)famous Conservative by Sir Eugene Nicks QC, KBE: soldier, lawyer, lover, brother, mother and Policy Advisor to the All-Portsea Conservative, Regressive and Imperial Association (established 1799). Read them here! In the wake of Jeremy Corbyn’s re-election, reactionary members of the Labour Party are pondering their next move. Sir Eugene Nicks, Policy Advisor to the All-Portsea Conservative, Regressive and Imperial Association (established 1799), has a proposal for them. Read it here! My brief history of political radicalism in Portsmouth is here. Losing a child is every mother’s worst nightmare. 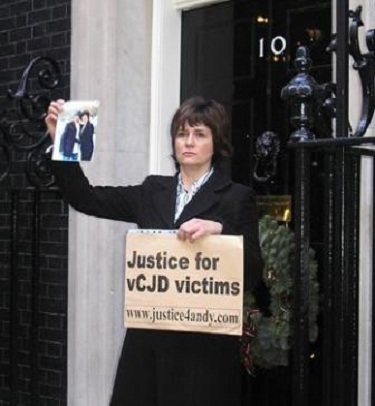 For NUJ member Christine Lord, the nightmare was compounded by the fact that her son Andrew died aged just 24 of VcJD, the human variant of BSE (“mad cow disease”). Who Killed My Son? is Christine’s riveting account of her six-year investigation into Andrew’s death and the broader issue of how BSE passed from animals to humans during the 1980s. She discovered that the public had been lied to time and again, that vital scientific evidence had been repressed and that government inquiries had been misled. This was a scandal that went right to the top of British politics, industry and agriculture. Furthermore, VcJD remains a huge risk today because millions were exposed at the time and the incubation period is long. While researching the book, Christine received a number of threats to her safety, but was not deterred from seeking out the truth. Who Killed My Son? is at once a page-turning thriller and an urgent piece of investigative journalism that should be read by anyone who cares about the food they eat, the politicians they elect and the scientists they place their trust in. Who Killed My Son? is available now as an ebook from Amazon. NUJ member Christine Lord launched her book Who Killed My Son? at a special meeting at Headland House on September 9th. Christine’s son Andrew Black died of vCJD – the human strain of so-called ‘Mad Cow Disease’ – at the tender age of 24. Christine vowed to Andrew on his death bed that she would find out how and why he had become infected, and who was to blame. At the meeting family members of other victims passed around chilling “before and after” photographs of their loved ones. These showed how, in a matter of months, vCJD can reduce a fit and good-looking 20-year-old to a bald, pale, skeletal invalid who looks closer to 70. As the disease eats away at the victim’s brain, he or she suffers panic attacks, depression, loss of mobility and progressive dementia. There is no cure for vCJD. The meeting also revealed the political and medical establishment’s mistreatment of victims’ families. Not only is there pervasive ignorance within the NHS about vCJD, but coroners are reluctant to name the disease on death certificates even when all its symptoms are apparent. For this reason, Rose Smith, whose son Billy was repeatedly misdiagnosed before succumbing to vCJD, describes the official UK death toll (176 people since 1990) as ‘not worth the paper it’s written on’. Relatives are often warned not to speak to the press about their experiences. While Christine was researching her book, she received dozens of anonymous threats. Shirley Warne, who lost her ultra-fit son Chris in 1997, attended the 2000 BSE Inquiry, during which key evidence was concealed and witnesses were pressured and intimidated into towing the government line. At the end of the inquiry, government scientists celebrated in a less-than-sensitive manner: they cracked open bottles of champagne right in front of Shirley and other grieving relatives. This may be the breakthrough the campaign needs, as previously the media has dismissed vCJD as an ‘old issue’, to use Christine’s phrase. ‘But in reality,’ she adds, ‘the issue is still very relevant. New cases are being reported, some in people who only started living in the UK after the official ban on meat and bone meal feed in 1996.’ Thus BSE still exists in the UK. In 2011, the Health Protection Agency UK announced that at least 60,000 people could be incubating vCJD. That should worry us all.